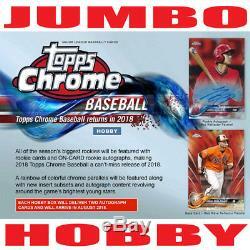 2018 Topps Chrome Baseball Jumbo HTA 8 Box Case FACTORY SEALED PRE-SELL 8/1/18. ARRIVES ON OR AROUND 8/1/18! Configuration: 8 boxes per case. All of the seasons biggest rookies will be featured with rookie cards and ON-CARD rookie autographs, making 2018 Topps Chrome Baseball a cant-miss release of 2018. A rainbow of colorful chrome parallels will be featured along with new insert subsets and autograph content revolving around the games brightest young stars. PRODUCT DESCRIPTION ROOKIE AUTOGRAPH CARDS Rookie Autograph Cards Rookie autograph cards are a pillar of the trading card landscape and Topps Chrome Baseball is the Home of the Chrome Rookie Autograph! Parallel cards will include: - Refractor Parallel: sequentially numbered. Purple Refractor Parallel: sequentially numbered. Blue Refractor Parallel: sequentially numbered. Blue Wave Refractor Parallel: sequentially numbered. Gold Refractor Parallel: sequentially numbered. Gold Wave Refractor Parallel: sequentially numbered. HOBBY SKUS ONLY - Orange Refractor Parallel: sequentially numbered to 25. HOBBY BOX ONLY - Red Refractor Parallel: sequentially numbered to 5. Red Wave Refractor Parallel: sequentially numbered to 5. HOBBY SKUS ONLY - SuperFractor Parallel: numbered 1/1. HOBBY SKUS ONLY - Printing Plates: numbered 1/1. 1983 Topps Baseball Autographs NEW Featuring the best rookie and veteran subjects of MLB on a vertical design and chrome technology. Parallel cards will include: - Orange Refractor Parallel: sequentially numbered to 25. Red Refractor Parallel: sequentially numbered to 5. INSERT CARDS 2018 Topps Chrome Baseball will showcase a compelling array of collectible insert subsets. Collect the famed 1983 Topps Baseball design on chrome technology. 1983 Topps Baseball NEW Topps celebrates the 35th anniversary of the 1983 set. Subjects will include a mix of veterans that were featured in 2018 Topps Series 1 and new rookies and veterans. Green Refractor Parallel: sequentially numbered. Orange Refractor Parallel: sequentially numbered to 25. Future Stars Highlighting the top young stars in Major League Baseball. HOBBY SKUS ONLY Freshman Flash Showcasing the brightest MLB rookies on a vibrant insert design. Look for randomly-inserted on-card autograph variations! - SuperFractor Parallel: #d 1/1 Also look for limited Base Card Image Variations of notable subjects from the Base set! AUTOGRAPH CARDS Freshman Flash Autographs An autograph variation of the insert, featuring on-card signatures. Future Stars Autographs An autograph variation of the insert, featuring on-card signatures. Superstar Sensations Autographs An autograph variation of the insert, featuring on-card signatures. ADDITIONAL CHROME CONTENT Additional insert and autograph content has been added to 2018 Topps Chrome Baseball to deliver the utmost in collector value. Superstar Sensations NEW A modern, contemporary digital art design. Rookie Debut NEW A card featuring a gold RC medallion, commemorating the rookie year debut of top veterans and current 2018 rookies. HOBBY SKUS ONLY - Green Refractor Parallel: sequentially numbered. Autograph Parallel: sequentially numbered to various quantities. Dual Rookie Autographs NEW Dual autographed cards featuring two top rookie pairings. BASE CARDS The extensive base set of 2018 Topps Chrome will include the biggest stars from Topps Series 1 and 2 on chrome technology, including the most current and collectible rookies. Base Cards - Refractor - Prism Refractor - Negative Refactor: limited. Green Wave Refractor: sequentially numbered. HOBBY SKUS ONLY - Blue Wave Refractor: sequentially numbered. HOBBY SKUS ONLY - Gold Refractor: sequentially numbered. Gold Wave Refractor: sequentially numbered. HOBBY SKUS ONLY - Orange Refractor: sequentially numbered to 25. HOBBY BOXES ONLY - Red Refractor: sequentially numbered to 5. Red Wave Refractor: sequentially numbered to 5. HOBBY SKUS ONLY - SuperFractor: numbered 1/1. 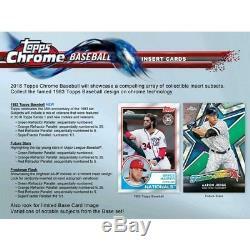 The item "2018 Topps Chrome Baseball Jumbo HTA 8 Box Case FACTORY SEALED PRE-SELL 8/1/18" is in sale since Tuesday, July 24, 2018. This item is in the category "Sports Mem, Cards & Fan Shop\Sports Trading Cards\Baseball Cards". The seller is "7stretch" and is located in Cooperstown, New York. This item can be shipped to United States, Canada, United Kingdom, Denmark, Romania, Slovakia, Bulgaria, Czech republic, Finland, Hungary, Latvia, Lithuania, Malta, Estonia, Australia, Greece, Portugal, Cyprus, Slovenia, Japan, China, Sweden, South Korea, Indonesia, South africa, Thailand, Belgium, France, Hong Kong, Ireland, Netherlands, Poland, Spain, Italy, Germany, Austria, Israel, Mexico, New Zealand, Singapore, Switzerland, Norway, Saudi arabia, United arab emirates, Qatar, Kuwait, Bahrain, Croatia, Malaysia, Brazil, Colombia, Panama, Jamaica, Barbados, Bangladesh, Bermuda, Brunei darussalam, Bolivia, Ecuador, Egypt, French guiana, Guernsey, Gibraltar, Guadeloupe, Iceland, Jersey, Jordan, Cambodia, Cayman islands, Liechtenstein, Sri lanka, Luxembourg, Monaco, Macao, Martinique, Maldives, Nicaragua, Oman, Peru, Pakistan, Paraguay, Reunion, Taiwan.